Text editing and replacement application. Is there a better alternative to CleanHaven? Is CleanHaven really the best app in Personal Info Managers category? Will CleanHaven work good on macOS 10.13.4? 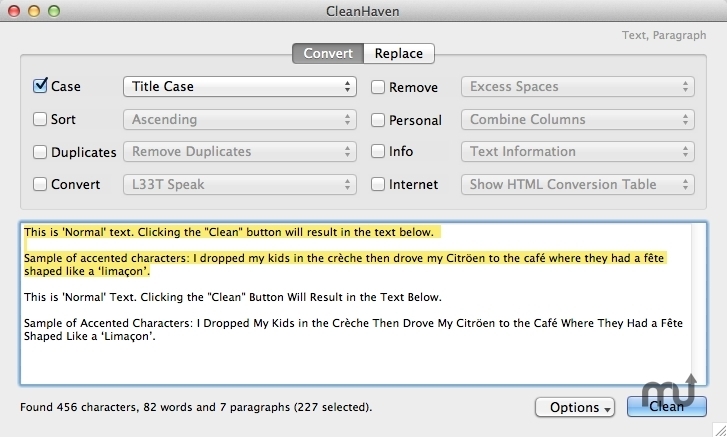 CleanHaven is an essential utility for people who work with text. [New] You can now remove all email addresses, or as an option, remove all text except the email addresses. [New] You can now view the invisible characters. [New] You can now spell check words based on every dictionary. It returns Correct if the word is in one or more dictionary and Incorrect if the word is not in any of the available dictionaries. If you have a large quantity of text that you want to clean quickly just dump it into CleanHaven. Choose the cleaning type from the control and get a preview of what the cleaned text will look like. Keep changing the controls until the cleaned text is correct, then paste the cleaned text into whatever application you want. Alternatively, bring the cleaned text back into the main window to perform more cleaning actions. Cleaning techniques include; setting the case of text to uppercase, lowercase, sentence case, title case or random case; sorting into ascending, descending or random order; removing leading/trailing/all spaces, tabs, periods, non-ASCII, non-letters, non-numbers, punctuation, carriage returns or line feeds. [New] You can now run the application at Full Screen on OS X. [New] You can now return a list of all the Dictionary languages that each word is listed in. [New] You can now remove excess tabs. [New] You can now remove all 'http://...' and 'www...' web addresses, or as an option, remove all text except the web addresses. [New] You can now find the number of days from a date until Christmas. [New] You can now Encrypt and Decrypt your text using a PassKey and Salt text. [New] You can now convert words to Alphagrams (the letters of each word are sorted) by word or by paragraph. [New] You can now convert paragraphs to Palindromes (every letter is reversed). [New] You can now convert diacritical text to its non-diacritical counterparts e.g. ç becomes c (lowercase) or É becomes E (uppercase). [New] You can now choose to convert to Anagrams by word or by paragraph. [New] You can now check the spelling based on an expanded number of built-in dictionaries. [New] When exporting the text to an SQLite database, TEXT fields are now automatically set to COLLATE NOCASE rather than the default COLLATE BINARY. This means that text searches are no longer case-sensitive for ASCII characters so searching for 'steve' will match 'Steve'. [New] The dictionary now includes the option to search for swear words within the text. [New] The Dictionaries now support accented characters. [New] The application is now a Cocoa application, giving you contextual options. [New] Now saves your Preferences and font size between saves. [New] Determine the dictionary words able to be obtained from the text. [New] Compatible with Retina Display. [New] Compatible with OS X 10.8 Mountain Lion. [Fix] When there are no options available the Options window description takes up the whole window. [Fix] The UK/USA Postcode to Region conversion now allows you to pick the individual item to return (All Data, City, Country, Latitude/Longitude, Latitude, Longitude, Region, State or SubRegion). [Fix] The Styled text and Table functions are no longer supported. [Fix] The HTML Name, HTML Number and URL encoding conversions are now much more reliable. [Fix] The case of the First Name no longer matters when looking up the Salutation. [Fix] Options window doesn't show unless there are entries available. [Fix] Finding the number of days left in the year now works for months with less than 31 days. [Fix] Converting Anagrams no longer freezes when converting multiple character words of the same letter.